OK, let me get this much out of the way. I didn’t finish in the money at the Cooking Light Ultimate Reader Recipe Contest in Birmingham. But I refuse to say I lost, because it was an honor and a pleasure to be there. I’ll give you a recap ... but I’m going to need to do it in a few entries. I’ll start with Monday, the first day in Birmingham. When I opened the door of my room at the Embassy Suites Hotel, I knew this contest would be a treat. First, the hotel room was attractive and spacious, with two rooms – a sitting room and a bedroom – as well as a big bathroom. I immediately spotted the gifts that were waiting for me on the table in my room – and I LOVE gifts! There was a red Cooking Light backpack with a Cooking Light water bottle and corkscrew inside. In addition, there was a large white box adorned with a red Cooking Light bow. That contained a divided wooden box containing five different gourmet salts – gray salt, Hawaiian red salt, and three flavored gray salts. I was thrilled with this gift. I’ve eyed gourmet salts at the store, but have never brought myself to spend the money on them. The contestants gathered in the hotel lobby in the afternoon. It was great to see some familiar faces, particularly Anna and Erin, who I knew from the Pillsbury Bake-off in 2004. I also met a bunch of friendly new people from all over the country. You would think that the atmosphere before a competition with $35,000 in prize money would be tense, but it’s really not. Most of the people I’ve met at cooking contests (this was my third) are very cordial, and many friendships are started at them. Our first official function was a tour of the Southern Progress headquarters. Having worked in advertising, I’ve seen a fair number of headquarters and office buildings, and this was the nicest I’ve seen. If you’re interested, take a tour. The next task was checking our trays in the test kitchen to make sure we were given all the ingredients and equipment we requested prior to the competition. My tray was in order; the only thing I needed to do was decide on a serving platter. I chose a square white one. I envisioned the test kitchens to be industrial looking and loaded with stainless steel. I was surprised to see that they looked just like someone’s home kitchen – clean, but lived in. They were in an “H” formation, with four kitchen areas bisected by an aisle. 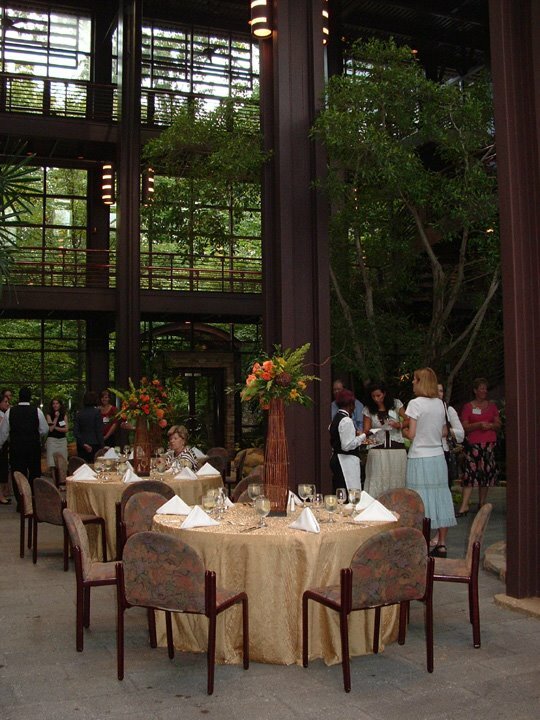 Once that was done, we had a reception and a lovely dinner that was catered in the headquarters. That's what's pictured to the right -- it's not a restaurant! We met several editors and test kitchen staff, all of whom were very cordial. Ellen Carroll, who ran the contest, was the epitome of southern hospitality, and not just because of her southern accent. She was gracious, funny, and full of life. Early tomorrow, I’ll be flying to the Cooking Light Reader Recipe Contest in Birmingham, Alabama. Whenever I go on a trip, my mom will casually ask me, a week before the trip, if I’m done packing. She does this because she is the kind of person that actually packs for a trip a week in advance. She also sets the table days before a gathering at her house. She has already asked me where I’ll be staying when we travel to the Chicago area at Thanksgiving time. That gene missed me. I pack up until the last second, and most of our vacations begin by Tom turning around the car to retrieve an item I’ve forgotten. The firsts guests to arrive for a party at my house get corralled into setting the table and lighting candles. And I’ll begin thinking about our Thanksgiving plans sometime in early November (sheesh, at least I’ve decided where I’ll be for Thanksgiving). So I have started packing for Birmingham... but I haven’t finished. I have packed the items most critical to the enjoyment of airplane travel -- reading material for the plane and snacks. I can’t help but compare my snacks to those Amanda Hesser described in her Cooking for Mr. Latte. I’ve since returned the book to the library, but my memory is that she packed herself a gourmet spread. When the flight attendant noticed her feast, he snuck her a bottle of premium wine from the first class cabin. On our last trip, the flight attendant spotted me pouring myself a couple of Dots candies from the box. He held out his hand for a contribution. Anyway, this will be my last blog entry until later this week. My friend, Diane, and I went to see Keith Urban perform at the New York State Fair last night. It was a (to use Diane's favorite word) FANTASTIC concert. I've been to a lot of concerts, and I'd put this one in my top five. Why do I mention this on a food blog? Well ... because that man looked good enough to eat! Har, har, har. Sorry, I couldn't stop myself. No really, I'm a married woman and of course I don't take much notice of such things. I like Keith Urban for his music. He's quite a performer -- an excellent vocalist and guitarist (I should know, as I'm mediocre at both) – and he even tickled the ivories on one song. OK, I’ll tear myself away from the memories of the concert to write about food. This was my first time at the New York State Fair – or any state fair, for that matter. I’ve wanted to enter the culinary contests at the fair for a few years now, but procrastination has always gotten the best of me. We stopped by the arts & home building to check out the entries. The culinary entries were in the back corner of a room devoted to senior citizen crafts. Today was canning day (or some such thing) and there was a shelf crammed with lots of jars of pickles, jams and so on, with some jars bearing ribbons. There were also a few pies in a small refrigerated display case. We puzzled as to why the pie with the blue ribbon had a teeny slice taken out of it, while the 2nd place pie was almost all gone. I was expecting the food winners to be displayed the way the other crafts in the building were, so I was a bit under whelmed -- but not enough to discourage me from throwing my hat in the ring next year. Not too far from the arts & home building we spotted the huge booth of a familiar establishment – the Dinosaur Bar-B-Que. “The Dinosaur,” as it’s called here, is a very casual bar-b-que joint located in our downtown. I’ve been there just once, but the atmosphere was fun and the food was very good. We quickly decided on that for our dinner. We split a full rack of ribs platter, which came with a side of beans and cole slaw ($21). The ribs were meaty, smoky, and tender, although we both agreed we’d prefer them with a little more sauce. The beans were really tasty and unlike any beans I’ve tried. Diane thought she tasted lime; I tasted something smoky, like chipotle. We scraped those clean. The cole slaw was shredded cabbage with a slightly spicy dressing. The texture was nice and crunchy, but we’d both prefer a sweeter flavor to compliment the smoky flavors of the meat and beans. Still, it was a much better meal than I expected at the State Fair. We wandered through the International Food Pavilion and the rest of the fair en route to the concert. I was amazed at the vast variety of foods you could get there. Then came the concert, and all thoughts of food vanished from our minds. All in all, it was a scrumptious evening. I’m busy practicing and packing for my trip to the Cooking Light Reader Recipe Contest, so I’ll do one last report on the food we had out West. When I travel, I like to absorb the local atmosphere. I always read the local newspaper (I majored in journalism, so I feel lost without my morning paper). And I like to sample the local fare, whether that means going to locally owned restaurants or eating dishes unique to that area. In the Western United States, the huckleberry is the most famous (or, at least, the most heavily marketed) native berry. As a result, I made it my aim to taste some authentic huckleberry fare. 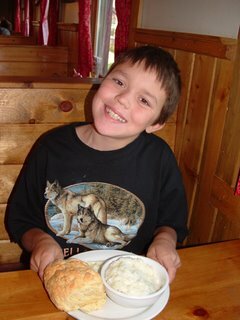 I did eat huckleberry ice cream at two tourist attractions - Yellowstone Bear World and Mountain River Ranch. 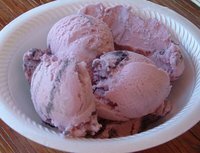 At both places, it was a pretty lavender-colored ice cream with a dark purple swirl. It was tasty; I’d describe the flavor as a sweet cross between grape and blueberry. My hunch was that this ice cream probably was artificially flavored, so I kept looking for the real taste of huckleberries. When we were at the Mammoth Dining Room in Yellowstone (which, by the way, was our best dining experience in the park), I spotted a huckleberry skillet sweetbread on the breakfast menu. It sounded like just what I was looking for, but the menu indicated that we should “allow extra time for this item” – and the waitress mentioned that the kitchen was short staffed. I suppressed my foodie inclinations and had the breakfast buffet, giving us more time to traverse the Mammoth Hot Springs. Throughout Yellowstone and the surrounding area, I spotted all kinds of really expensive huckleberry goods – huckleberry jelly, syrup, taffy, candy, lip balm, and so on. But they all appeared to be mass produced for the tourist trade, which doesn’t bode well for their culinary value. I did purchase huckleberry lip balm (the dry atmosphere was killer on my skin) and huckleberry muffin mix as a souvenir for a friend (although I haven’t parted with it yet). But I kept looking for something that looked a little less mass produced, and maybe a little more reasonably priced. In the end, my search was all for naught. I never did get that bona fide huckleberry experience. I guess I’ll just take comfort in my lip balm and imagine what could have been. Last night was a beautiful August night in Rochester – clear skies, temperature in the low 70s. A perfect night for a baseball game, so that’s what we did. Rochester is home to the Rochester Red Wings, AAA farm team to the Minnesota Twins. They play at our downtown ballpark, Frontier Field. The field was built in1996, but it’s designed to have an old-fashioned feel, with lots of iron and brick. At night some of Rochester’s architecturally interesting buildings are illuminated, giving the place a great atmosphere. Last year, we took our kids to a Milwaukee Brewers game at Miller Park. (I have fond memories of tailgating – oh yeah, and watching the Brewers play – at the old County Stadium while I was in college.) Although we enjoyed tailgating with our friends, we weren't thrilled with Miller Park. It was hard to focus on the game because our seats -- which weren't cheap -- were so far away from the action. And we felt raked over the coals by the food prices. 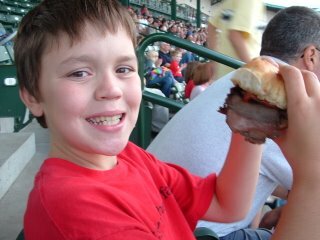 Both Tom and I agreed that we’d rather go to a ball game at Frontier Field any day of the week. Well, there’s the ticket prices. You can go to a Red Wings game for about ten bucks – five, if you’re with a group. And for that price, you still have a very good view of the field. But enough about baseball. A big reason I like Frontier Field is the food. There are several tasty choices, and the prices – well, I wouldn’t call them a bargain - but they aren’t in the stratosphere like Miller Field. Yeah, Miller Field has brats, and I do love a good brat. But we can get Johnsonville brats here, and it doesn’t take a whole lot of skill to simmer them in beer and throw them on the grill. At Red Wings games, the rest of my family goes for the usual stadium fare – corn dogs, nachos, Dippin’ Dots. As for me, my two favorites are a Red Osier roast beef sandwich or a crepe from Simply Crepes. Simply Crepes overstuffs their crepes with a variety of salads – and I’m not talking iceberg lettuce and croutons. My favorite has greens, strawberries, nuts, and blue cheese. They also have dessert crepes that look wonderful, although I’ve never had one. I thought I might try one last night, but I was too full from the roast beef. 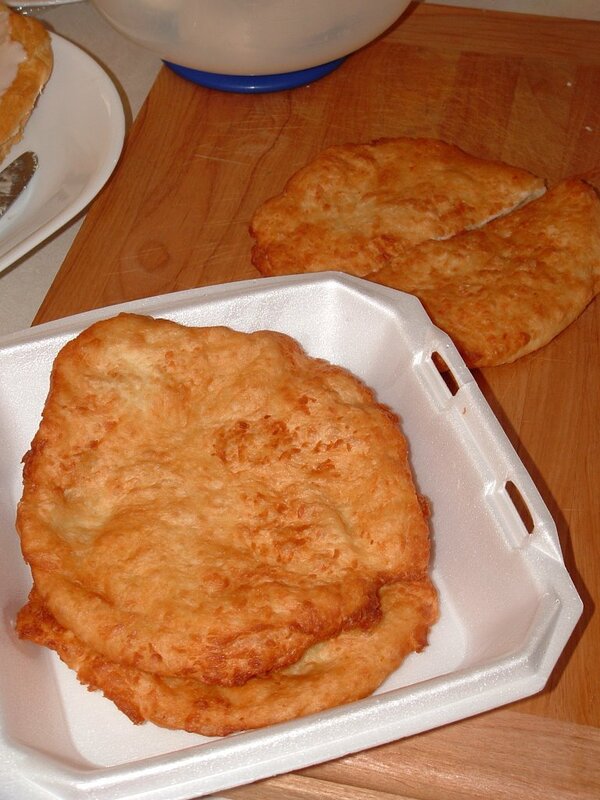 But not too full to share some fried dough during the 7th inning. Oh, yeah. The Red Wings lost. One of my hobbies is entering recipe contests. I just the call that I'm a finalist in one of the biggies! I'm too excited to write much, so I'll give you a tried & true recipe for the green beans that are so beautiful right now. I got the original recipe from the Cooking Light Great Food board, where I've found many good recipes, and tinkered with it a bit. Steam or boil green beans for 4-5 minutes until crisp-tender. In medium skillet over medium heat melt butter. Add garlic and cook until fragrant, about a minute. Add green beans, and chicken bouillon and stir well. Saute about five more minutes, or until grean beans are to desired doneness. Turn heat up to medium high, then pour in the wine and let most of it evaporate. Off heat, add salt and pepper to taste, and stir thoroughly. Serve immediately. My Aunt Cathy and Uncle Ron, who live in Idaho Falls, were terrific hosts when we visted them earlier this month. They really wanted us to experience everything their area has to offer. Eastern Idaho, by the way, is the area depicted in the movie “Napoleon Dynamite.” Both my boys were Napoleon Dynamite for Halloween last year, so I got a heavy dose of Napoleon Dynamite imitations for about a month. One morning, Uncle Ron came home with something a local restaurant, Cedric's, calls a “scone.” Aunt Cathy says the most of the other restaurants around call it Indian frybread. This Idaho delicacy was a little smaller in diameter, about a half-inch thick all around, so it was chewy all over. It came with honey butter, which melted as we slathered it over the warm rounds. Did I like it? Well, what do you think? I was freakin’ starving! GOSH! Our family took a wonderful vacation to the Yellowstone Park area last week. This trip was about appreciating nature and having some family fun, so food was a relatively low priority. Because I need to catch up after being away for a week, I’ll write about the few food-related aspects of the trip in a series of postings. I’ll start with the end – our last, and best, restaurant meal of the trip. The breakfast at Bubba’s Bar-B-Que in Cody, Wyoming, was recommended to us by the owners of our motel there. They did not let us down. The restaurant was very casual and the prices were reasonable. 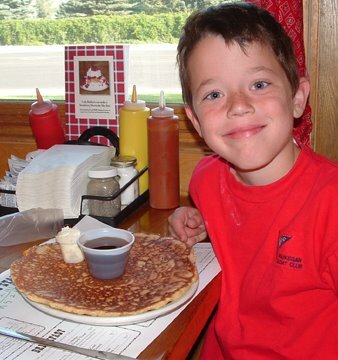 D. ordered one pancake from the children’s menu. Tom ordered French toast and bacon. B. ordered a kids breakfast combination that included grits – something new for him. He likes to try new things, which I think is great. I ordered a biscuit sandwich, which I thought would be a relatively light meal. D.’s pancake was about the size of a Frisbee flying disc* and he really enjoyed it. Tom gave the French toast and bacon two thumbs-up. B. didn’t care for the grits, even after he added honey to them, but that has more to do with the fact that he wasn’t raised with them than with the cooking. I was shocked at the size of the biscuits, which B. and I both had on our plates. They were roughly the size of the Kaiser rolls you get here, and had a crumbly texture. My “biscuit sandwich,” which I thought would come with a single egg, had a cheese omelet draped over it. There was absolutely no way to pick up the “sandwich.” Instead, I used a knife and fork. Turns out, Bubba’s Bar-B-Que is a franchise, but I can’t find a Web site for it. I’m told there are locations in Cody and Jackson, Wyoming, as well as Idaho Falls, Idaho. As for our motel, if you ever need a place to stay in Cody, I recommend the Big Bear Motel. It’s reasonably priced, and a quick walk to the rodeo (which is why we were in Cody). The rooms are simple but clean – and after two TV-free days in Yellowstone, my kids were thrilled to see a TV. Furthermore, the owners are exceptionally helpful. When keys were locked in our trunk (I won’t say who did it), Bill ably got us into our car so we could pop the trunk. I went to a pot-luck picnic yesterday, and signed up to bring cookies. I brought a batch of cookies for my upcoming contest, but I wanted to try something new as well. 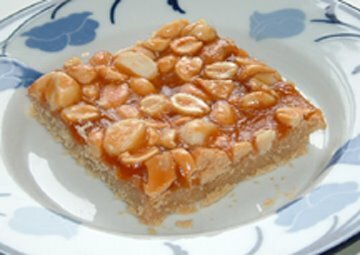 I decided to rid my cupboards of a bunch of bags and jars containing small quantities of nuts – cocktail peanuts, dry-roasted peanuts, macadamia nuts, almonds, and cashews. I used a recipe I had copied from the Cooking Light "great food" bulletin board awhile back. The only change I made was to use a larger pan. The bars weren’t hard to make. They held their shape nicely and had a very buttery flavor. When I make this recipe again, I’ll probably try pouring the cooked mixture over the crust, spreading it around and then sprinkling the nuts on top. Press into an ungreased 15 X 10 pan (I used 12 by 18). Bake 10 - 12 minutes. Bring to a boil and boil 2 minutes, stirring constantly. Pour cooked mixture over nuts. (I moved the nuts around to make sure they were in the cooked mixture.) Bake 10 - 12 minutes. When cool, cut into bars. My husband, Tom, and I share the same birth date -- July 10 -- but not in the same year. When people hear about this, they usually say something like, "aw ... isn't that cute." It may be slightly cute, but it's really a pain. If I make him a birthday cake, I'm making myself a birthday cake. If I throw him a party, I'm throwing myself a party. You get the idea. Several years ago, we came to an agreement that we wouldn't give each other gifts, but we'd have a nice night out to celebrate our birthdays. (This is a big relief to Tom, as it gives him one less occasion to sweat about a gift for me.) Our friend, Marie, is kind enough to volunteer for babysitting duty on these nights. Our usual spot for our birthday dinner is on Conesus Lake, one of the Finger Lakes, about 45 minutes from our home. We make the trek to The Conesus Inn because of its exceptionally delicious prime rib. It's this beef that makes The Conesus Inn Tom's favorite restaurant. I'd prefer something a little more culinarily adventurous, but I'm happy enough to go there. It's a pretty setting, has a casual antiquey atmosphere, and while the food isn't terribly creative, it's generally well prepared. The last time we went to the Conesus Inn was probably a year ago. That was the time we sat at three different tables. The first table they gave us was in a dark corner with no view of the lake. It was also right next to an air conditioning duct, which froze my legs. When I complained, they moved us to one of a handful of white PVC tables that are outside, on the concrete slab between the restaurant and the lake. After we had been outside for a few minutes, it began to rain. Hard. So they moved us back inside to a table that made me happy. It's times like those that Tom utters his favorite line from "When Harry Met Sally" (one of my favorite movies): "You're the worst kind of woman. You're high maintenance but you think you're low maintenance." This time, I was wiser. I assertively told the hostess, "we'd like a table where we can see the lake." After a little pause, she said we could wait at the bar until one opened up. We had drinks in their bar, which has quite a collection of antiques. As I admired them, I wondered who gets the task of dusting them. After a few minutes, they called us to our table which did, in fact, have a view of the lake. And the setting sun was shining right in my face. Since I requested this table, I didn't complain about the glare. (I also didn't want to give Tom more fodder for calling me "high maintenance.") In the setting sun I watched a guy stop a jet ski and jump off to swim in the lake. He looked like he was enjoying himself, but he made me nervous. I pondered what I'd do if he looked like he was in trouble. Would I stand up and scream "call 911?" Dash out the door to rescue him? I distracted myself by looking at the menu. It was different than last time. In the past, they had the kind of menus you often see in fancy restaurants -- fancy type on parchment-like paper, held in a leather-like folder with a gold string. The new menu was a plastic spiral binder, with sheets printed on a color printer and inserted into clear sheet protectors. I paged through the menu in search of the description of the way the Conesus Inn ages their beef. This information had always been in the old menus. I looked because I recently read It Must Have Been Something I Ate, a thick collection of essays by foodie icon and lawyer Jeffrey Steingarten. One essay was devoted to the process of aging beef, the incredible flavor and texture this process imparts, and lamenting the fact that this is rarely done anymore as steak houses go for the quick buck at the expense of flavor. When I read the essay, I had thought about emailing Mr. Steingarten and letting him know about the wonderful beef at the Conesus Inn. Maybe I could join him for dinner there, I fantasized. As we dined I could listen to the foodie icon wax eloquently about bluefin tuna or sea salts or whatever he was into at the time. Then he would profusely thank me about turning him onto this exquisite place that wasn't all too far from his New York City dwelling. Maybe he'd even mention me in one of his columns. Back to the Conesus Inn ... the sheet about aging beef, which had been prominent in the previous menu, was curiously missing from the current menu. Suspicious, I thought. While the format of the menu had changed, it looked like the dishes hadn't. A few chicken and pork dishes. Some fish from distant oceans. But from what I've observed, people order two things at the Conesus Inn -- King Crab legs and prime rib. I love King Crab legs, and they are always good at the Conesus Inn. I considered sampling the aged beef I had read about so much in Steingarten's book. One choice was a combination of crab legs and prime rib, so I asked the waitress how many crab legs came on the combination plate. Two, she answered, plus a claw. That didn't seem like nearly enough crab. So I ordered the crab legs, with a promise from Tom that he'd let me taste his beef. Tom's only choice was the cut of his prime rib -- princess, queen, king, or Truman. If you ask me, there's a subtle form of male pressure going on with those names. How many men would be comfortable ordering a princess cut, even though he knows the larger cuts are a bad idea for his health? Tom, being comfortable with his masculinity, ordered the queen cut. First the server brought us a basket of warm bread -- some rolls and a crusty French bread -- and little packets of real butter. Yum. I love restaurants that serve warm bread. Next was our salads -- iceberg lettuce with a sprinkling of canned garbanzo beans, black olives, and some croutons, plus a ring of red onion. I ordered mine with poppy seed dressing. I know a lot of foodies who would sneer at this salad, particularly in the middle of summer, when so many locally grown alternatives are available. That's why I don't consider myself a foodie. It was tasty and crunchy. I ate it all. Finally we got our entrees. My plate had a pile of bright red crab legs, which came with a little cup of melted butter. I sized them up for a few seconds, considering where to start cracking. "Look, she doesn't know what to do," exclaimed a voice from the boisterous table of eight (seven women, one man) next to us. She leaned over and gave me a tutorial on how to eat crab legs. "That's the knuckle ... don't start there, break it off ... break off the pointy part too ... start with the middle part ... see, it's already cut for you." I listened patiently because she meant well. But for the record, I've ordered crab legs before. I know how to eat them. Tom's beef looked the same as it always did. Big. Thick. Juicy. He dug in, and I asked him how it was. "It's not as salty as before," he commented. I remember the flavor he decribed, but I personally wouldn't call it salty. To me, the flavor was intensely beefy. As always, there was too much food for one meal, so we wrapped up the leftovers in the plastic bags they set on our table without our asking for them. We didn't want to have dessert right away, so we drove 30 minutes closer to home and stopped at Aladdin's Natural Eatery in Pittsford. The Pittsford Aladdins is in an area called Schoen Place. People can't agree on how to pronounce its name correctly (here's a link to the debate), but in any case it's a quaint area with a bunch of old buildings along the Erie Canal. Aladdins has two outside areas overlooking the canal -- a balcony and another area at sidewalk level, where we were seated. I've been to Aladdins dozens of times, and I almost order their yummy chicken pita sandwich. Their fruit and nut salad is also very good, provided you ask them to go easy on the yogurt. I always stop to admire the display case of desserts at the entrance, but it's rare that I actually order one. Tom immediately picked his favorite -- carrot cake. I had a hard time deciding from the baklava, key lime torte, and the carrot cake. I picked the carrot cake and when it was served, I regretted it. Carrot cake is a fall or winter dessert. It's just not a dessert that goes with watching the ducks paddle around the canal on a pleasant summer night. There was nothing wrong with the cake, though. It was moist and subtely spicy with tangy cream cheese frosting. I happen to prefer a carrot cake that has walnuts, but Tom doesn't. After dessert, we took a short walk along the canal and we were home by 10. Today for lunch, I fished my baggie from the fridge. I picked out the crab meat, mixed in a little Hellman's Light mayo, diced celery, salt and pepper, and served it with some buttery Pepperidge Farm butterfly crackers. I shared it with my 11-year-old son, B., who pronounced it "one of the best things I've ever eaten." Tom picked at the bone of the prime rib and said, "this isn't good. I just didn't want to admit it last night." 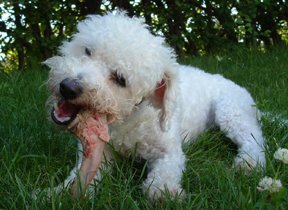 I usually simmer his leftover bone to make broth for some killer French Onion soup, but instead Tom gave the bone to our dog, Charlie. Charlie, in his own way, pronounced it one of the best things he had ever eaten. So it looks like I won't be dining with Jeffrey Steingarten at the Conesus Inn. And I predict we'll be finding another restaurant for future birthday celebrations.